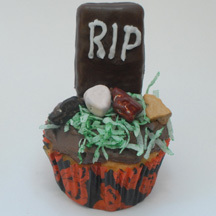 Halloween is coming, and so are the ghosts and ghouls, rising up from the graveyard to bring you … cupcakes? Turn a chocolate-covered graham cracker into a gravestone with “R.I.P,” a party guest’s name or anything else you can fit on with writing icing. What You Need: 1 cupcake; chocolate frosting; chocolate covered graham crackers; shredded coconut tinted green with food coloring (for grass); candy rocks. (You could also include a mellowcreme pumpkin). How to Make It: Frost cupcake generously. Holding graham cracker vertically, use white writing icing in a tube or pastry bag to write “R.I.P.” or whatever you’d like. Insert cracker in frosting. Place tinted coconut and candy rocks around tombstone. This entry was posted on Wednesday, September 10th, 2008 at 4:41 pm	and is filed under Halloween cupcakes. You can follow any responses to this entry through the RSS 2.0 feed. Responses are currently closed, but you can trackback from your own site.